Robbie Owens has been the head coach at Grand Junction the previous eight years, compiling a 47-38-1 record. The night before he interviewed for Helix High’s head football coaching job, Robbie Owens attended a Highlanders boys basketball game. Sophomore Carson Baker, Helix’s likely starting quarterback next fall, heaved a near full-court pass, leading to the final-seconds, game-winning basket. The next day Baker was on a student panel interviewing Owens. “I just saw you throw your first touchdown pass of 2016,” Owens joked at the interview. Owens figures to see many more Baker TD passes. 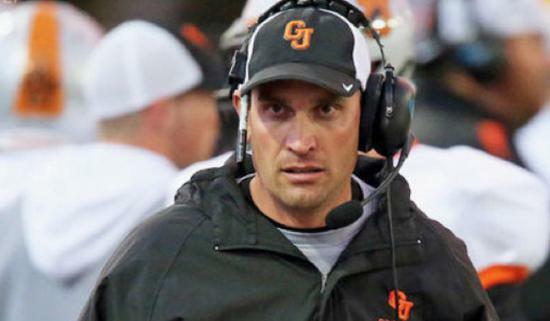 On Wednesday, the former Grand Junction (Colo.) High coach was named Helix’s head coach. That Owens, 42, attended the basketball game, plus knew Baker and other Helix football players by name impressed many. “I think the kids were blown away,” said Helix Athletic Director Damon Chase. Owens lands one of the most coveted coaching jobs in the state, the Highlanders having suffered one losing season in the last 40 years. The football program’s combined record since 1973: 372-115-11. Owens takes over for Troy Starr, who was 83-18-1 in eight seasons, winning two section championships and one state bowl title. Owens will teach at Helix, likely in physical education. Owens was the head coach at Grand Junction the previous eight years, compiling a 47-38-1 record. The program was elevated to 5A, the state’s highest, upon Owens’ arrival in 2008. The Tigers were 10-2 in 2010 and 11-1 in 2011, reaching the state quarterfinals both seasons. Grand Junction struggled to a 4-6 finish in 2014, followed by a 2-8 record last season. The Tigers faced the challenge of being isolated in western Colorado, often driving nearly four hours to Denver for games. The school is dropping to 4A next season. Back-to-back losing seasons didn’t deter Chase. Owens was the head coach at Coconut Creek (Fla.) High in 2007, finishing 7-4. Prior to that he was an assistant coach for 11 seasons at Division II Colorado Mesa University. Owens brought Grand Junction teams to compete against other California schools at USD summer camps in 2013 and 2014. It was through those contacts that he learned about the Helix opening. While he served as a defensive coordinator at Colorado Mesa, he has focused on the offensive side as a high school head coach, running a no huddle power pistol attack. The Tigers averaged a combined 32.7 points the past six seasons. Interestingly, Helix ran a similar offense under Starr, though the Highlanders typically huddled. The job drew 36 applicants, including coaches from Florida, Texas and South Dakota. Seven finalists were interviewed, five from San Diego County, including longtime Helix defensive coordinator Sam Friend. Owens has met with Friend and hopes to retain him. Owens, meanwhile, said he’s a fan of the Highlanders’ Scottish traditions. “I love kilts,” he joked.